Last night I spent a wonderful evening with my friend Lisa at her home with family and friends! Thank you Lisa! Boy, we had a good time playing with my stamps, and even made the best of it when I had forgotten the brown ink for my owl and he had to be Staz-On Black! Yikes! Anyway, we discovered that the owl was a very big part of her life right now as there must be an owl mascot at Brandeis University where her daughter is now a student! How funny to see that owl pop up! This is the first photo. We used the Jack of all trades stamp set for this card. Notice the little bit of bling on his hat? The ladies loved the bling! We had sparkling teeth, eyes, hats, you name it! I didn't think of all that! The "spooky" from the Wicked Cool stamp set was stamped in Versamark on the orange c/s -- pretty sure that was Tangerine Tango although "Jack" was stamped in Pumpkin Pie. I was going to use black satin ribbon across the middle but discovered late yesterday that I was running low, so I embossed a black c/s strip with the Spiderweb folder -- that worked too so I could demonstrate our fabulous Big Shot!! The paper is Fright Night -- I never did purchase any of the Pick your Poison paper but I'm not quite sure why -- I think the rat on one of the pieces of paper turned me off!! Project number 2 was a matchbook -- I used the hostess stamp set from the mini catalog -- we stamped the autumn wreath in Tangerine Tango and then colored in the leaves. Then I (not we!) stamped the owl in Soft Suede and popped him up! Isn't he so cute?! Inside, I stapled a pack of M&M's -- yum! This was kind of project number 3. Above is actually my hostess gift -- a small 3x3 box filled with 3x3 cards like the one above (all different -- pumpkin pie c/s, black, concord crush, old olive, etc. ), each stamped with a different character from the Batty for You stamp set. 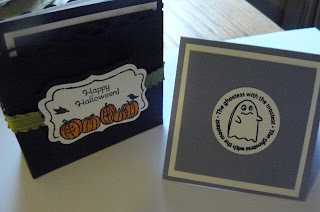 I demonstrated the embossing technique with the "Ghostess with the mostest" stamp set which I thought was entirely appropriate for my hostess!! Well, gotta run and prepare for this weekend's open house! If anyone lives around here and wants to host a party with me, call me! I'll come up with some more fabulous projects!! And if you're around on Sunday afternoon, come check out my Holiday Open House! Can't wait to share with you all! 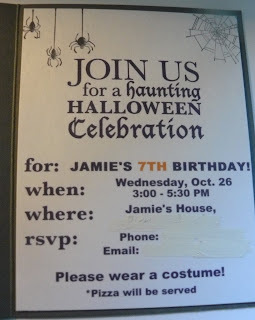 I recently had a request for a Halloween Birthday Party Invitation! What fun!! It was for a 7 year old girl and I definitely saw something on Stampin' Connection which started the wheels turning! I'll tell you right now -- the outside was definitely cased from someone! 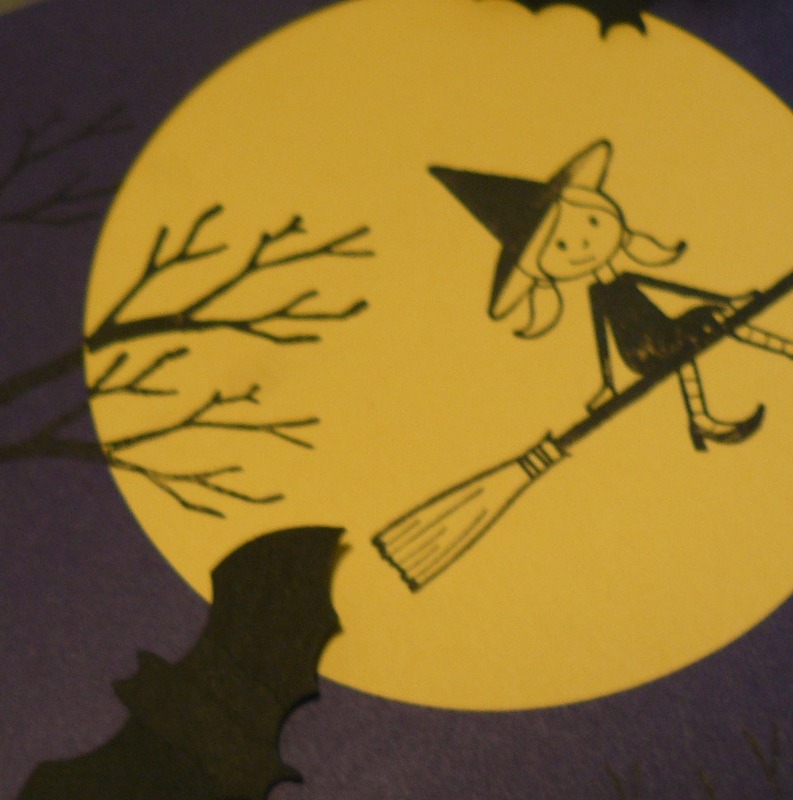 I recalled seeing the Out on a Limb little witch being used for the front of a card and I fell in love with her! Well ... so did my client! Check out this adorable card ("IMHO", as Jan Tink always says ... "in my humble opinion!" LOL!) So, here she is! The base of the card is Basic Gray c/s. I took a 4" x 5 1/4" piece of Concord Crush cardstock and used my Big Shot to cut out a 3" circle with that die. I then put a So Saffron square behind the open circle. 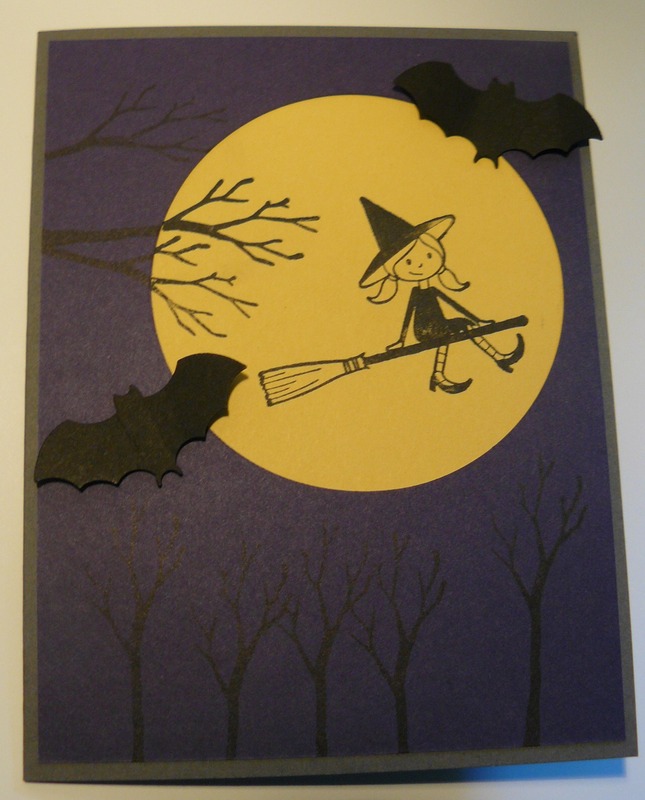 I stamped the trees and "branches" (same stamp, just horizontal) from the Out on a Limb stamp set, stamped my broom, used my Stamp-a-ma-jig to stamp my witch on the broom, and was done! Well, done with the one ... only 19 more to go!! I used My Digital Studio for the inside elements of the card (with a tiny bit of stamping!). Party Time II was an update released this summer -- I really like this one! Oh yes, and the bat punch is retired but how can you not use a bat punch at Halloween?! 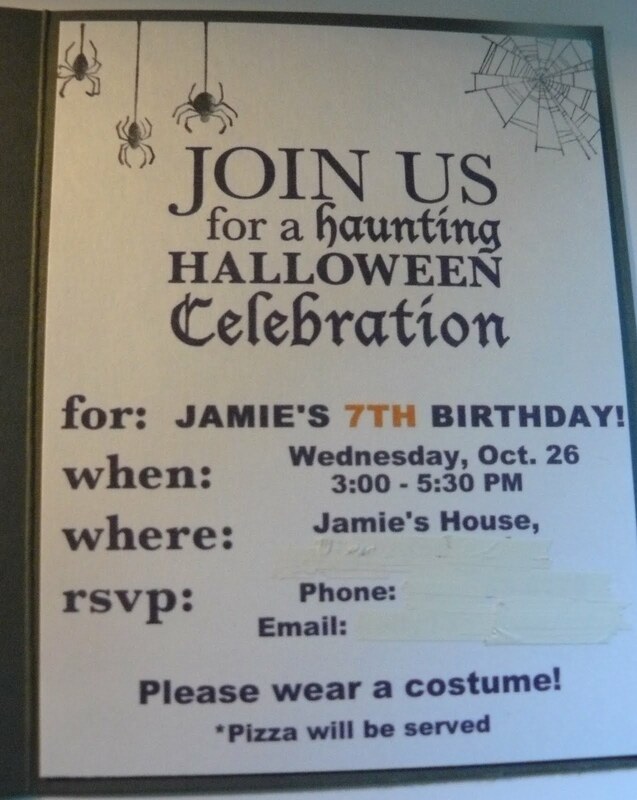 I used the "Haunting Celebration" stamp image from the Party Time II MDS update for the top, the "for/when/where/RSVP" for the left side, and then just inserted text (whited out for privacy of course!). I'm finding that playing with the MDS program is very fun and it gets easier with practice. What I also discovered though, is that I get instant gratification when I order a stamp -- bonus!! I can go online, order the stamp or the update, and it's "automagically" delivered to me so I can use it the same day! Wow! 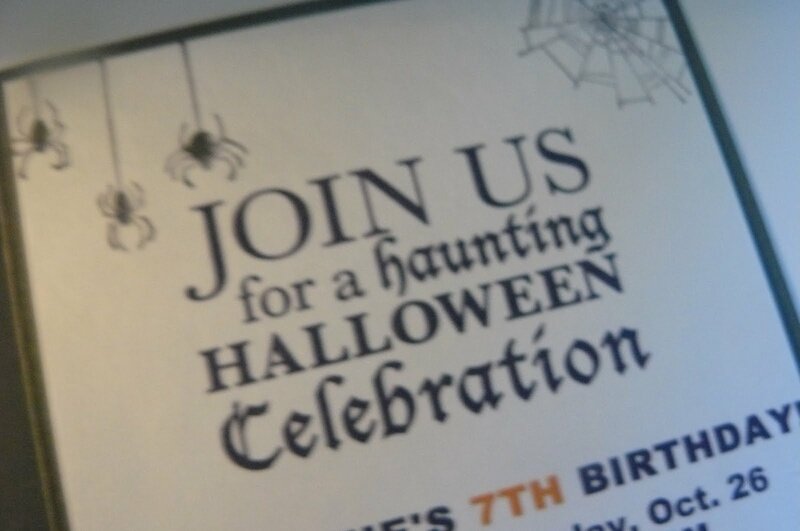 The stamping took me minutes inside -- the spider web from Wicked Cool, and the spiders from Out on a Limb. I hope you all have purchased My Digital Studio! There's a special hostess download that can be used for hostess gifts, baked gifts for friends and neighbors, etc.! Gotta have that! Check it out! Seriously people, it’s a lot of stuff. It will be perfect for all your holiday parities! 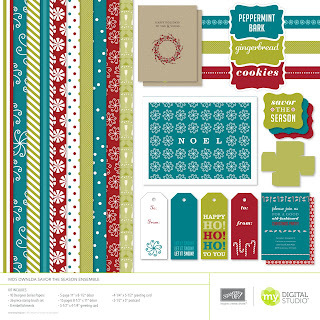 But what I really love about this ensemble is that the templates, punches, and Designer Series Paper patterns are so versatile that you are going to find uses for it all year long. Don't forget though -- it's only available to hostesses, so contact me if you want to have a party!! Anywho, thanks for stopping by! I'll have more to share tomorrow I hope!! Selene, with her husband, who helped her out ALL DAY! She was very busy calling out raffle numbers like a Bingo Operator -- so many fabulous raffle prizes donated by demonstrators, friends, and local businesses! There were 5 different cards that people could make. So organized! 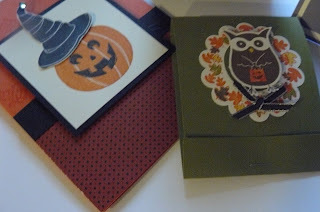 The cards were super-lovely! I wish I had a picture of the table flowers! All made with paper: Flower Die Cuts using the Big Shot, the Flirtation Doily Specialty Paper, etc.! So cool! People were swapping! I forgot and ran out of time to make my swaps with my nursing schedule overnight last night! 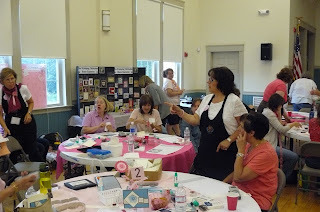 Great time to meet other people with the wonderful passion for stamping AND sharing! The inside of Harmony Hall in Dracut, MA -- this hall was donated! What a great space! Can you see some of the samples against the wall in the back?! No end to the creativity shared! 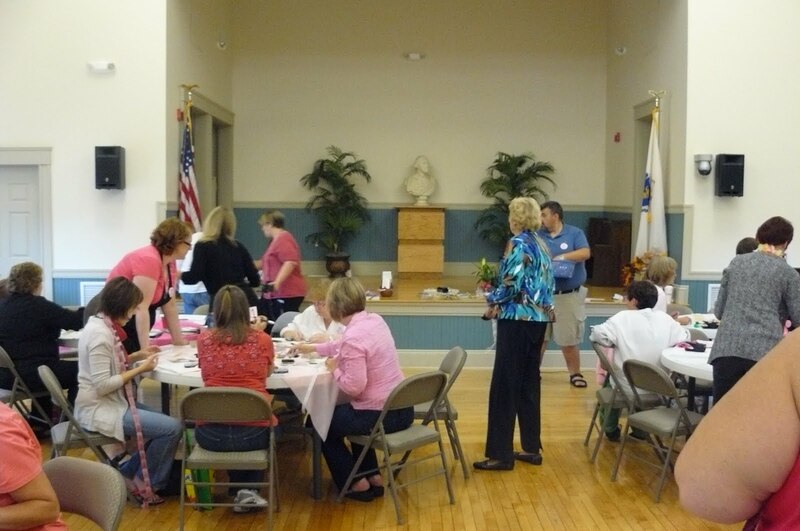 Of course, since the event WAS for "Stampin' Out Breast Cancer", the color of the day was pink! These lovely ladies were spotted by the Fashion Police and awarded the "spirit award"! (I might have made up the name of the award, but you get the gist of it!) Do you notice that even the exit signs appear to be pink? Not sure if that was an accident or not, but too funny! Besides pizza and water, one of the local party places donated this cake and these cupcakes! Don't they look lovely? I think my flavor was pumpkin! Yum! Well, I took 146 other pictures, but they were mostly swaps and samples. 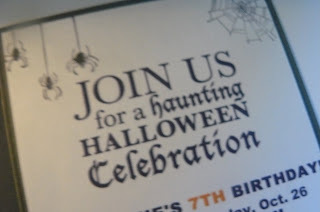 I guess you'll have to come next year (October 6th, 2012) to see what fun we had! !